Hey friend! 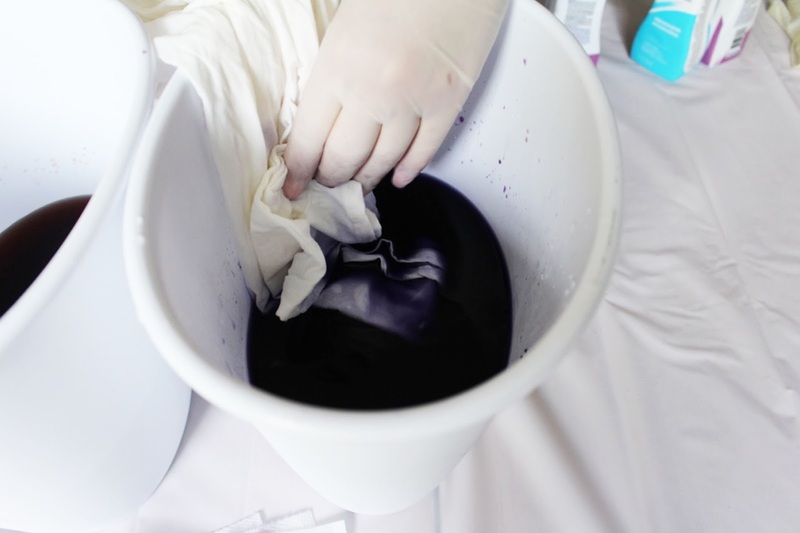 If you've followed Hey Wanderer for a while now, you know that we dye a lot of fabric. It's kind of our thing. So we knew we had to jump on this branded project with rit dye. 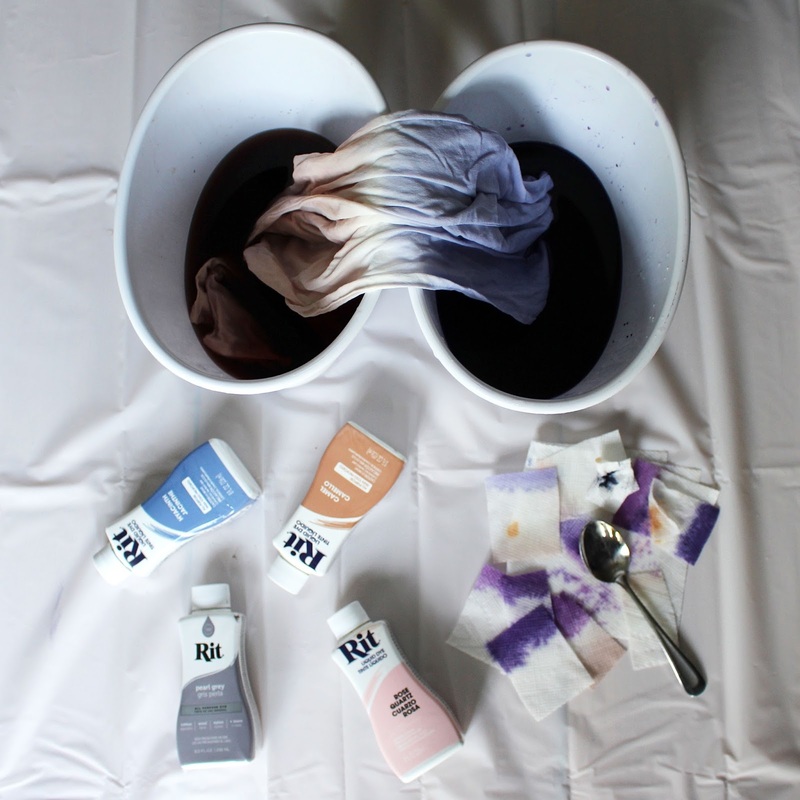 We are so excited to be working with them to show you how we create a two color ombre dye. We love how our piece turned out and it's actually a pretty simple process, as long as you have the right tools. As you can see, our colors have some texture and depth to them and if you want to recreate something very similar, follow our steps below. 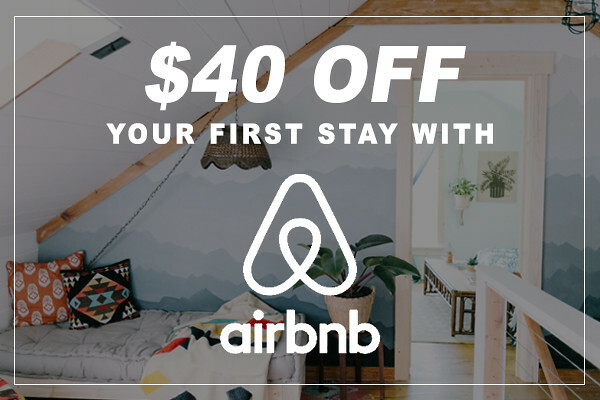 The only thing you'll need to decide is what article of clothing you have that needs new life and what colors you want to use to spruce it up. 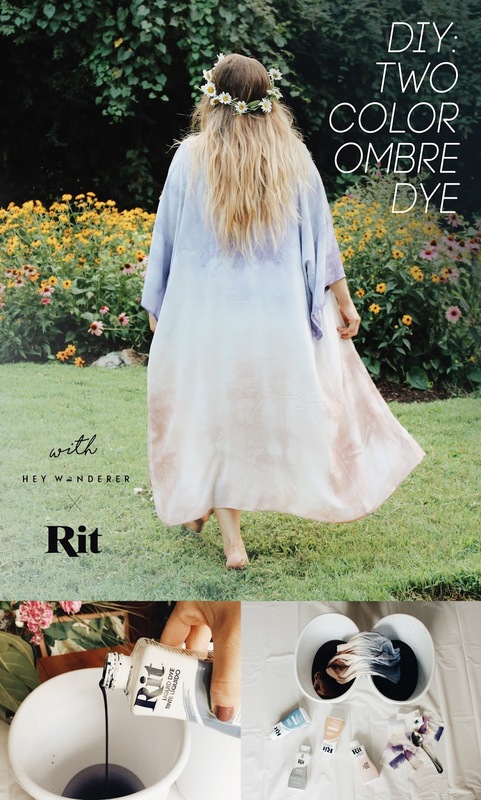 (We are using the dye for natural fabrics, but if you have something that you want to dye that is polyester, check out Rit DyeMore for Synthetics.) Let's get started! Step 1. 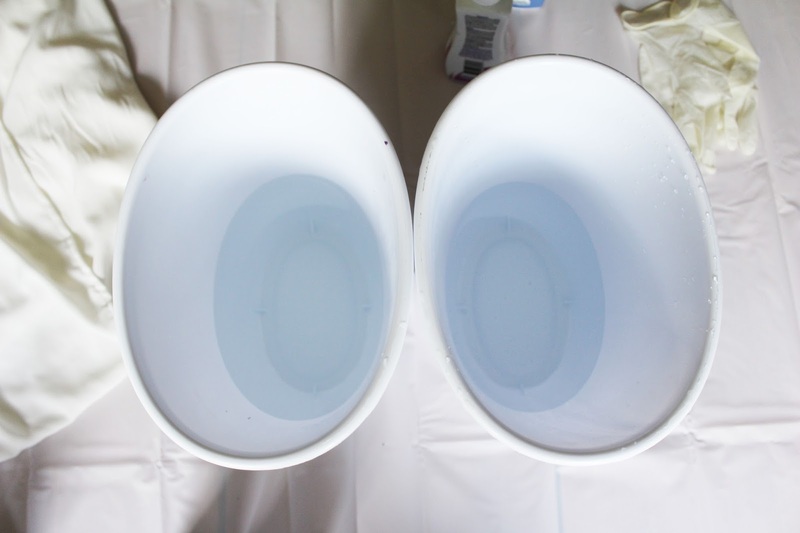 Fill two deep buckets with hot, hot water. We used 2 quarts of water in each bucket. Step 2. 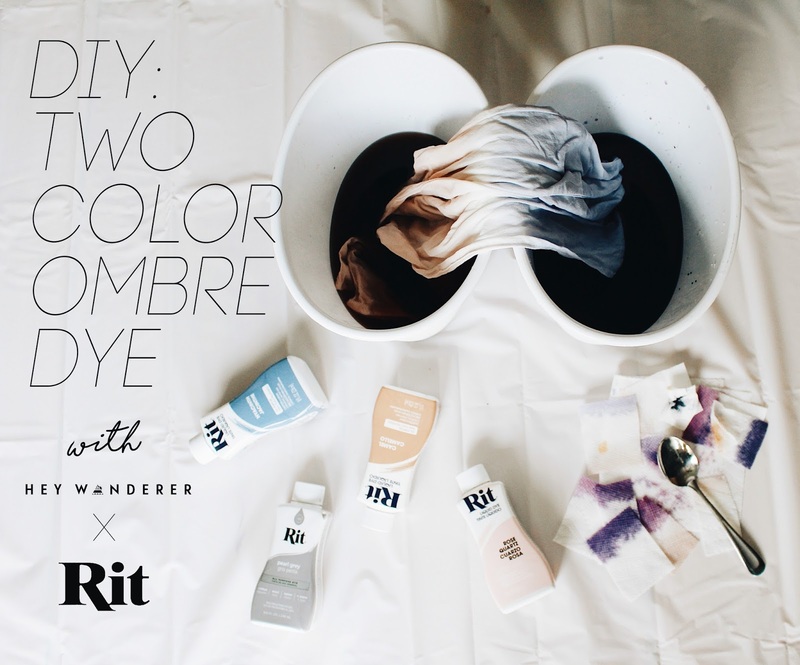 Add your rit dye to the hot water. For one of our colors we put 3 caps full of Rose Quartz and 1 cap full of Camel in a bucket. In the other we put 1 cap full of Pearl Gray and 1 cap full of Hyacinth. If you want to do another color or you need color inspiration, check out rit's 500 color recipes. It's pretty fun to see all the colors you can create with 30 base colors. 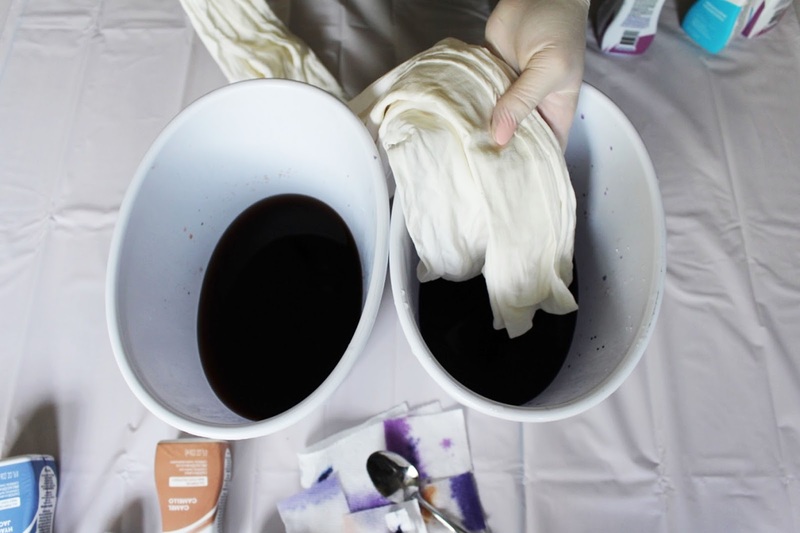 Pro Tip: Use small pieces of paper towel to dip in your dye bath to make sure it's going to be the color you are wanting to achieve. Step 3. 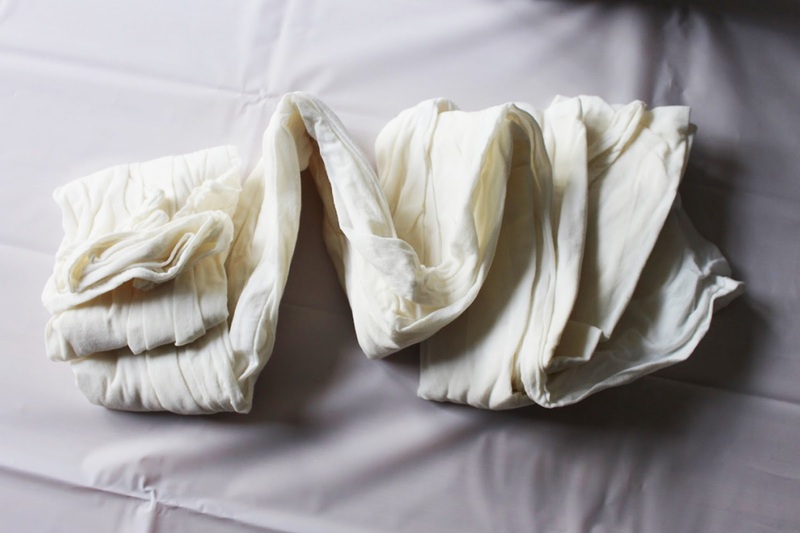 Fold your garment accordion style from top to bottom. Step 4. 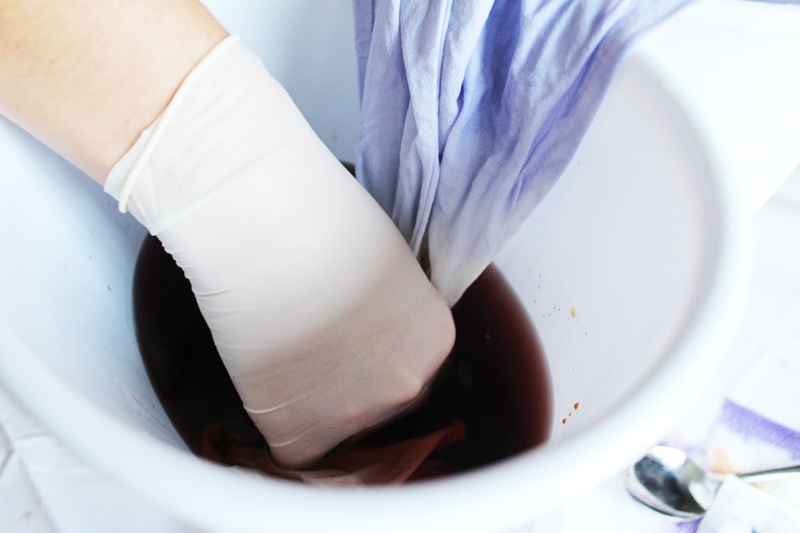 Wet your garment. Step 5. Put one end of your garment in one color. And put the other end in the other color. You'll want to make sure your buckets are right next to each other. 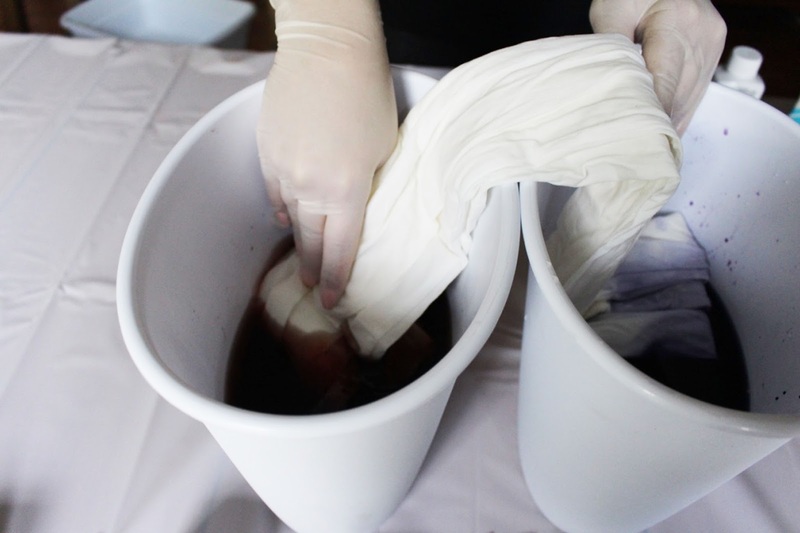 Push down your garment into the dye bath enough to cover the white areas. Step 6. 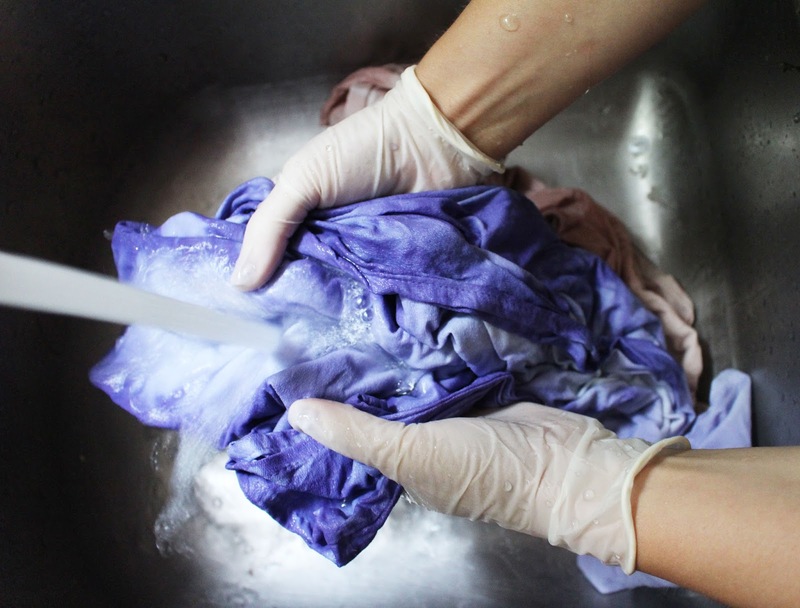 Rinse your garment with cold water until the water runs clear. 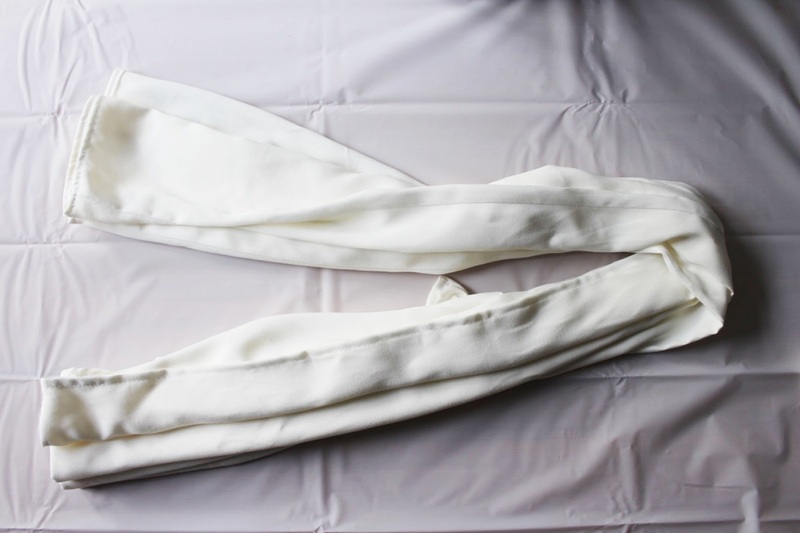 Then either lay your garment flat to dry or throw it in the dryer if it is safe for the fabric. 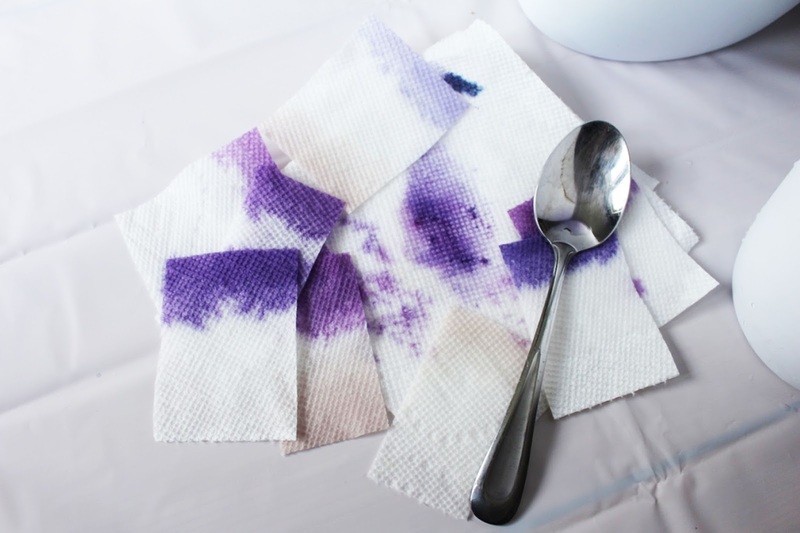 *If you are using the dye fixative, use it before rinsing. Follow the instructions on your bottle. 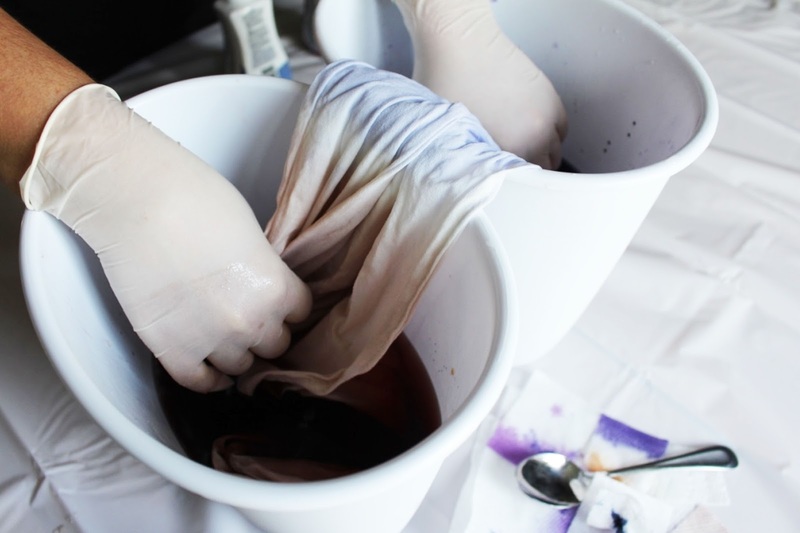 Your newly dyed garment will be perfect to wear to your next music festival or just with friends hanging in the summer. **This post is sponsored, but all opinions are our own!